I walk a lot - but with the silly weather and of course the joy of daylight savings ending, I haven't walked a lot since returning from vacation a few weeks ago. Saturday I did about five miles, so yesterday I upped that and walked about nine miles. All fun and good, until I got home and took off my shoes. I had blisters on the inside part of my feet that were so big you could see them through the socks! Looked like nasty bunions or something. Ow. I need to get some new shoes, clearly! Ow. I admit it, I like Pop-Tarts. They're tasty, but oh-so-not-healthy for you, so I rarely eat them. Pop-Tart has a new line of "whole grain", but they're still pretty high in calories and fat, so I skip 'em. 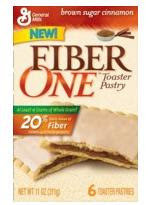 But when I saw the new Fiber One Toaster Pastries, I thought I'd give 'em a try. I went with the brown sugar cinnamon flavor - with frosting! Woo! Well, maybe woo. Though the pastry is tasty, it's still un-fulfilling to eat just one (and of course they're wrapped in twos). It's not as tasty as a Pop-Tart, but it's not a bad replacement. Nutritionally speaking though, it's not a miracle food - only 5 grams of fiber doesn't seem like the typical Fiber One way there. One of these did not fill me up at all. Two filled me up a bit, but I thought about how much I could've eaten for 380 calories and 10 grams of fiber, and was really disappointed. Another note: the Fiber One Toaster Pastries are six to a box, and Pop-Tarts are eight to a box. These bagels are available online and in select west coast grocery stores. Super Wal-Mart locations sometimes carry them too (sadly my closest one is about an hour away). So sad that movie theatres frown upon you bringing in your own food. We went to the movies tonight and there are just no good options at the concession stand! Ugh. If only you could get some air-popped popcorn instead of the oily action. Doh. Diet-related: shockingly, not walking and eating crap causes weight gain. Stop the presses! Raisinets snack packs for Halloween are cute - only 200 calories for 3 packets. However, resisting eating more than a couple of those packs is really tough... glargh. 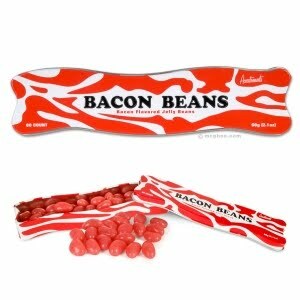 Bacon jelly beans, courtesy of our friends over at Archie McPhee. So what's new with me? Well, this week marked the 100th week since I started dieting. I weighed in at 85.8 pounds gone, so that average kinda blows. This year has been a massive diet struggle, and I'm glad to be "maintaining" so to speak, but I've walked well over 3 million steps for the year, and I'm so very frustrated that it hasn't moved the scale. With daylight savings ending tomorrow, it'll be even harder to get in the exercise. Hopefully watching what I eat more closely will help.